98 Cents is a new peer-to-peer charity app available to download now on Google Play. We’ve seen a huge rise in the popularity of peer-to-peer apps, so it’s no surprise that we now have one dedicated to raising money for charity and those in need. 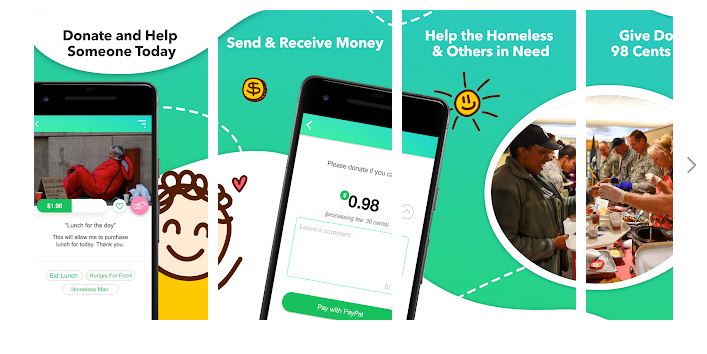 98 Cents allows users to donate money directly to causes that mean something to them, whether that’s to fight homelessness, feed the hungry or provide shoes for those who can’t afford any. The app has no overheads, either, so every penny you donate goes to that cause – except for some unavoidable credit card processing fees. It’s no secret that when you donate to some larger charities a good portion of your money pays for things like marketing – not with 98 Cents. You can donate anything between 98 Cents and $9.80. Transactions are transparent so everybody can see how their donations are being spent – I think it’s great that you can see exactly how your donations are having an impact! It isn’t just for making donations, though. If you’re in need 98 Cents can help you. You can also fundraise for your own causes and receive donations from the community to support it. 98 Cents vets all donation recipients to ensure all donations are going to an honest cause. If you’re a passionate supporter of a cause, regular donator to charity or you’re in need of support yourself, 98 Cents provides a way for people to make a difference with their pocket change. You can download 98 Cents on Google Play now or visit www.98cents.net for more information.